It was around high noon as we rode in. In the bell tower were two young boys ringing the church bell, calling to everyone that the funeral service was about to begin. The only restaurant closed up just seconds before we rode up (probably because of the funeral). 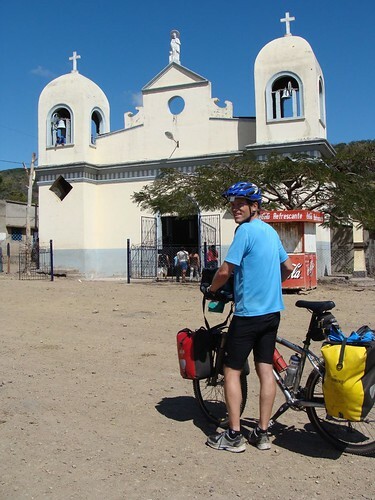 Everyone was strolling toward the church and those that were not just sat and stared at us, hungry we rode on to another part of the village that had promise for lunch time nourishment and knowing that we had some hard climbs ahead. With just a small printed sign above a door, I stopped to ask where we could find something to eat. An older man rushed off to find his aging wife. Bingo, there was some food on the stove which they would gladly serve us. We still do not know if this was an official place that served food but they did for us. They were first concerned that we would not like the food they had to offer- beans, squash cooked in the beans and corn tortillas and some kind of milky fruit like drink. We assured them we eat everything, several times. (It turned out that the only gringos they´d ever met were Peace Corps volunteers who were vegetarians and not too thrilled with the local food.) As we ate, we had 20 or so people come visit us. The younger children sat next to us, the teenagers peered in the windows and our host sat and talked about their lives in San Marco. On the wall above our host where photos of the presidents and leaders that they had respect for including the famous dictator Somoza and many faded reproductions of Christ. They lived here for ever and now 39 grandchildren which many where sitting right next to us. Lunch was great, she asked 30 Cordobas for the meals, about $1.50 was well appreciated by us as we had a steep 1500 foot climb ahead of us. It took over 4 hours to climb and walk before we reached the pavement. We finally made it to the pavement with an hour left before sunset and still had 10 miles to go to get to Jinotega. The road was a cyclist´s dream. Smooth aspalt, large shoulder, little traffic which drove real slow, lots of people walking and biking and slightly down hill. We made it to town with time to find a hotel before the sunset. The first one had no room, I think it was one of the famous love hotels and that no one spends a full night there. They recommended the Hotel Central down the street. We checked in before the sun had really gone away. Oh it was a great day of bike touring in Central America.